Considering a getaway for the whole family? Belize has all the ingredients for an ideal family vacation. Easy to get to, affordable, safe and with plenty to do, it’s the perfect spot to pick for your next trip. Here are just some of the reasons the whole family will get a kick out of a family trip to our sunny paradise. Belize is home to 145 species of mammals, 139 reptiles and amphibians and over 500 species of birds. From howler monkeys to manatees to scarlet macaws, it’s a nature lover’s paradise! There are also plenty of opportunities for kids to get up close with Belizean wildlife. You can try a Monkey River tour, a crocodile tour at Ambergris Caye, or a visit to the stunning Blue Morpho Butterfly Exhibit. Sunshine is the norm in Belize, and the whole family will want to make the most of it. You can while away the days on the beach, go island-hopping or jump in the water for swimming, snorkeling and paddling. With Belize’s picture perfect beaches and sparkling oceans, there’s plenty to keep you occupied doing absolutely nothing at all! If your family are all active types, you’re in luck! Belize is brimming with opportunities to get your heart-rate up. Think ziplining, caving tubing, and horseback riding. Snorkeling, diving, kayaking and hiking are all popular ways to get moving while enjoying an incredible tropical backdrop. Belize is home to numerous Ancient Mayan ruins, giving you plenty of history to explore. Some key sites include Xunantunich, Lamanai, Lubaantun, Nim Li Punit and Barton Creek Cave. Prime yourself for incredible stone structures and beautiful archaeological wonders. You can also get an insight into the local culture with Mayan cooking classes, chocolate making and more. 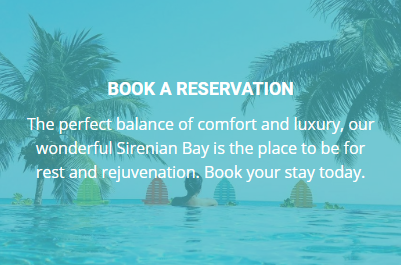 Belize is all about family and community, and there are plenty of large, beachside accommodations for your family to stay at (like ours at Sirenian Bay). These are typically located close to sun, sand and water, meaning that there’s plenty around to keep youngsters occupied. With on-site amenities and helpful staff around, they take all of the stress and guesswork out of vacationing with kids. In addition to boutique accommodations, there are also several family-friendly all-inclusive resorts to enjoy. Whether your family is highly active or extremely laid-back, Belize is the perfect spot for that longed-for getaway. With so much to do, it’s easy to tailor your vacation to suit the needs and interests of everyone! Need some help planning your Belize family vacation? Get in touch!